I sat there online, looking at all the sites that weekly network kill lot horses in need of being saved before they ship. This week one horse in particular grabbed me. Her name was Toffee. It was still early in the week so I knew there were several days before she would ship. I watched all week hoping and praying someone would bail her. Day after day passed and no one was saving her. Finally it was Saturday afternoon and I knew we only had until 6 PM, no one was stepping up. Toffee had a note with her. The note extolled her talents “gaming, eventing and jumping” and further stated that she had “4 new shoes” put on just the week before. The owner was going to college and couldn’t keep her. “HOW DID SHE END UP HERE? ?” I kept saying. Well, that didn’t matter, fact was, she WAS there and needed someone to care. I couldn’t let her ship. I couldn’t let down the college-bound teen who erroneously trusted someone so I made the call, paid her bail and the next day we drove 5.5 hours each way to bring her to safety. Today Toffee is named Promise!! Promise is thriving and looking for her forever home. She is talented, has an auto swap, loves the ring, jumping and trail riding. She adores water and would love someone to take her down to the brook! Promise represents my promise to fight against slaughter after a horse I had was sent off to auction by someone I considered a friend. My horse had an enlarged thyroid. She was a young tattooed TB. I never found her. I hurt daily over losing her into the corrupt system that is so well hidden from our eyes. IT’S TIME! Time to stand up, to educate ALL Americans about the underground horse slaughter pipeline, time to change laws. Please help us in our mission. Please support USHWR today with a one time donation or an ongoing monthly donation. It is only through the generosity of our supporters that we can carry on our mission to save America’s horses. Bentley is a 5 year old 13 hands green broke Welch type pony who was rescued from a slaughter lot. He was still a stud. He is ideally suited for someone who wants to finish a pony off their way and can continue his training. He has been ridden and is very accepting of a rider, no buck or rear! Bentley is completely sound. 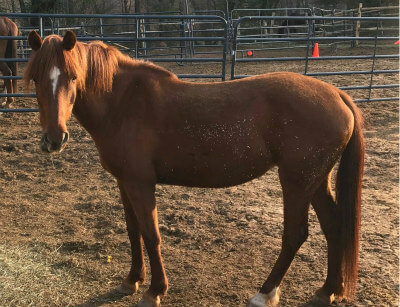 Available for adoption under right circumstances, nearby to Avon, CT and with his long term buddy Romeo or available for on farm lease here at the rescue. Quarter Horse, Approx 15’3H mid teens, very well schooled, western of english, sound, suitable for beginners on lead line, intermediates off lead, perfect ground manners! Available for adoption under right circumstances, nearby to Avon, CT and with his long term buddy Reilly or available for inform lease here at the rescue. OTTB, approx 15’3H mid teens, well schooled, showed as hunter jumper with great results. Available only for on farm lease at the rescue initially with possibility of adoption. Thoroughbred, Approx 16’2 and growing. He is just turning 3 years old. Very green broke. Needs a person very experienced in training a green horse. Faith is an 8 year old 13.2 hands pony that was rescued after being purchased by a kill buyer and was going to be slaughtered. This incredibly sweet and mild tempered girl has a strong work ethic with substantial training. She is especially fond of jumping. Faith is looking for that forever home. She is ideal for anyone who is interested in showing Hunter/Jumper as she is very talented, smart, and willing. Faith is completely sound.